May 4, 2014 (Novato, CA) - Senior midfielder Tim Albo drove through the middle of the Cal defense and rifled in the Mustangs first goal less than a minute into the WCLL title game on Sunday. It was a sign of things to come, as the Mustangs dominated the Bears from start to finish for a 16 – 5 victory, earning their 5th WCLL championship in the last six years. Cal Poly was clicking on all cylinders as they raced out to a 5 – 1 first quarter lead, and an 11 – 2 lead at the halftime break. Offensively, the Mustangs were led by the attack duo of Dylan Gonsalves (6g) and Joseph Sarjeant (3g, 3a). In all, eleven different Mustangs tallied points in the title matchup. The defense had another strong outing, limiting the Bears to only five goals, and holding their high-scoring attack duo of Sean Hayden (1g) and Nick Sheehan to a single point combined. Senior attackman Gonsalves also scored 2 goals and 2 assists against Stanford in the semi-final on Saturday, giving him 8 goals and 2 assists for the championship weekend. For his stellar performance in both games, Gonsalves was named the WCLL Tournament MVP. With the title victory, the Mustangs earned the league’s automatic qualifier for the MCLA National Championship tournament being held in Orange County from May 12 – 17. Cal Poly has been named the #11 seed and will take on regional rival UCSB in the first round on Monday. The Gauchos come in as the #6 seed and earned an at-large berth out of the Southwest Lacrosse Conference. Monday, May 12th, 2014 at 4:30 p.m.
Cal Poly landed eight players on the 2014 WCLL All-Conference team, all of them on either the 1st or 2nd Team. Mustangs’ head coach Marc Lea was also named the 2014 WCLL Coach of the Year, receiving the award for the 4th time in his 14-year coaching career. Congratulations to all of the Mustang All-Conference players!! The Cal Poly Men’s Lacrosse team will take on divisional opponent Santa Clara on Saturday in their last home game of the season. The Mustangs are looking to close out the regular season undefeated in WCLL league play and maintain their momentum heading into the WCLL Final Four the following weekend. With the the #1 seed in the league playoffs already secured, Cal Poly will look to keep their league winning streak going and send out eight seniors with a victory in their last game in San Luis Obispo. Saturday, April 26th, 2014 at 2:00 p.m. The Upper Sports Complex is located on Sports Complex Road past Baggett Stadium. Field 1 is located at the far end of the synthetic turf fields, furthest from the baseball stadium. There is a large seating area on the grass hill adjacent to the field, but there are no bleacher seats available. Admission is free to all CPLAX home games. April 19, 2014 (Palo Alto) - Cal Poly overcame a slow start on the road to defeat Stanford 10 – 6 on Saturday and remain undefeated in WCLL league play. The victory, along with a Cal upset over Sonoma, guaranteed the Mustangs the #1 seed heading into the WCLL Final Four on the first weekend of May and a likely rematch against the Cardinal. Stanford jumped out to a 2 – 1 lead at the end of the first quarter behind the outside shooting of sophomore midfielder Peter Doyle, who was limited to just the two early goals for the game. Cal Poly climbed back and took control of the game in the 2nd quarter. Senior attackman Dylan Gonsalves connected on his first two shots of the day and also found fellow attackman Joseph Sarjeant open in the middle of the field for another goal. Sarjeant dished out two assists of his own, as the Mustangs shook off the slow start to take a 5-2 lead at the half. Cal Poly continued their control of the game after the break, stretching their lead to 8-3 at the end of three and coasting to their fifth straight league victory. Four veterans carried the Mustangs offensively as Gonsalves (2g, 2a) and Sarjeant (4g, 2a) were joined by senior midfielders Matt Dobbs (1g, 1a) and Zack Jones (3g, 1a) to account for all ten Mustang goals on the day and six of their eight assists. Cal Poly will finish up the regular season next Saturday at home against the Santa Clara Broncos, and will look to send their graduating players out with another league victory on Senior Day. March 4, 2014 - Cal Poly earned their first WCLL league victory of the 2014 season with a 10 – 4 victory over the #16 Cal Bears on Sunday. Cal opened the scoring with two unassisted goals – one from attackman Sean Hayden and the second from midfielder Tom Riis – to take a 2-0 lead midway through the first quarter. Mustang attackman Jake Sesti hit two shots in the final minute of the period to tie the game at two apiece. The Cal Poly defense would control the game from that point forward, shutting down the Bears offense in the second quarter and allowing only two more goals in the game. With the victory, Cal Poly improves their record to 4-1 on the season and held steady in this week’s MCLA Coaches Poll at #13. With the loss, Cal dropped two spots to the #18 ranking. The game felt a bit like a Mavericks reunion game, with many of the key players hailing from La Costa Canyon High School in Encinitas, one of California’s most powerful high school lacrosse programs. For the Bears, all of their goals came from Mavericks’ alums Hayden (1g,1a) and Riis (3g). For Cal Poly, former Maverick, freshman Jake Sesti had an impressive five point performance (3g, 2a) and earned the game ball. On the defensive end, junior close defenseman Luke Willon covered Hayden all game, limiting him to a single goal, while freshman LSM Cole Tudor chipped in with 3 ground balls and a goal that got wiped off the board due to an untimely timeout call. The Mustangs host a home double-header this weekend against Southern Methodist and Virginia Tech. Both games will mark only the second meeting between the teams in program history, with Cal Poly owning the 1-0 series advantage over both squads. Saturday, March 8th, 2014 at 1:00 p.m.
Sunday, March 9th, 2014 at 1:00 p.m.
February 25, 2014 - Coming off of two out-of-conference victories last weekend, Cal Poly jumped five spots in this week’s MCLA Coaches Poll. On Saturday, the Mustangs easily defeated UCLA 13-4 in Westwood, and then returned home on Sunday to take on the Loyola Marymount Lions. After bursting out of the gates to an early 4-0 lead, Cal Poly struggled at times but still walked away with a comfortable 11-5 victory. With the two wins, the Mustangs season record improved to 3-1, with their only blemish a tough one-goal loss on the road to the #4 UCSB Gauchos. This Sunday, Cal Poly will take on the Cal Bears in their first Western Collegiate Lacrosse League (WCLL) game of the season. The Bears come into the game ranked #16, and will be looking for their first win in San Luis Obispo in over a decade, while the Mustangs hope to avenge last season’s 12-7 defeat in Berkeley. Sunday, March 2nd, 2014 at 1:00 p.m.
After splitting their season opening weekend, with a dominant 19-5 victory over the Georgia Bulldogs at home and a narrow 6-5 loss on the road to the #6 UCSB Gauchos, Cal Poly gears up for another home and away double-header weekend. The Mustangs will travel down to UCLA on Saturday to take on a much improved Bruins squad, who comes into the contest with a 3-1 record. On Sunday, Cal Poly returns home for a matchup against Loyola Marymount University. Both UCLA and LMU will be aiming to upset the nationally ranked Mustangs, while Cal Poly will look to build on a solid season opening weekend. Sunday, February 23rd, 2014 at 2:00 p.m. The Cal Poly men’s lacrosse team will open up the 2014 season with an out of conference contest against the University of Georgia Bulldogs. Cal Poly comes into the season ranked #18 nationally after a tough 2013 season, and hope to get off to a good start in 2014 against #21 Georgia. This will be the first ever meeting between the Mustangs and the Bulldogs. On Sunday, Cal Poly will travel to Santa Barbara for a Blue-Green rivalry game against the #6 UCSB Gauchos. In recent years, the games between Cal Poly and UCSB have been extremely hard fought, and two of the last three games have been decided by only a one-goal margin. Saturday, February 15th, 2014 at 2:00 p.m. The Cal Poly Lacrosse team named Tim Albo, Matt Dobbs, Chris Nespor, and Sebastian Zorn as captains for the 2014 season on February 1, 2014. Each player was selected by their current teammates to represent them as leaders on and off the field. Albo, Dobbs, and Zorn are all seniors and Nespor is in his junior year. Midfielder Tim Albo returns for his final season after taking the 2013 season off. He was a key member of the 2012 squad, tallying 21 points and leading the team in face-offs. Midfielder Matt Dobbs was the second leading scorer on the Mustangs 2013 squad, and was awarded WCLL All-Conference Honorable Mention. Long-stick midfielder Chris Nespor led the team in ground balls and turnovers caused in 2013, and was also named to the WCLL All-Conference team. Sebastian Zorn is one of only a select few Mustang players in program history to be selected captain in two seasons. Zorn, who will anchor the close defense unit, has been named to the WCLL All-Conference 2nd team the past two seasons. The 2014 season is fast approaching and the Mustangs are busy getting ready for their season opener at home against the University of Georgia on Saturday, February 15th. 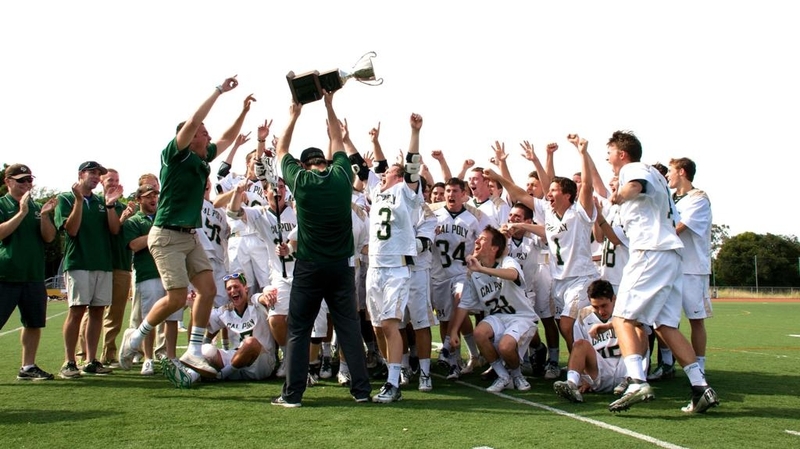 Cal Poly comes into the season ranked #18 in the MCLA Pre-Season Coaches Poll and will meet the Bulldogs, the defending SouthEastern Lacrosse Conference champions, for the first time in school history. The Bulldogs come into the contest ranked #21. Cal Poly was also named the #17 ranked team in the MCLA in Lacrosse Magazine’s Pre-Season Poll.